With Valentine’s Day right around the corner, chocolate is on my mind. In fact, Valentine’s Day sparks memories of my childhood days. Cheesy (but adorable) cards, Conversation Hearts (with Call Me and Love You printed in red ink), and Russell Stover’s and Whitman chocolate boxes. Back then I actually thought I didn’t like chocolate. I was suspicious of the oddly flavored, pseudo-fruit fillings. And unconvinced by the dodgy caramel and nut fillings. I just thought I wasn’t a “chocolate” person. Then I visited Switzerland (the land of chocolate) and was given carte blanche in a high quality chocolate shop. And I finally understood the obsession with chocolate! I’ve also done the research — on the real benefits of chocolate and how to get the most out of it. So if you plan to indulge yourself (or someone else) for Valentine’s Day with chocolate, please continue reading. Because I’m sharing the evidence-based benefits of chocolate, how to make sure you get the most from your chocolate, and my favorite chocolate brand. You’ve probably seen headlines and news snippets touting the health benefits of chocolate. Think it sounds too good to be true? Think again! Not all chocolate is the same. A high quality dark chocolate is going to do much more for you than a high-fructose corn syrup sweetened fudge topping. To make sure you're picking the best options, I’ve put together a mini chocolate education for you. 1.) Cocoa is NOT Cacao. You may see these words on chocolate products and think they are the same. Cacao fruit trees (also known as Theobroma Cacao) produce cacao pods. Cacao pods contain cacao beans. Cacao beans can be processed different ways. Cacao beans can be chopped into small pieces and are called cacao nibs. They can be heated and made into a paste (then often made into cacao bars). Most often, the beans are lightly heated until the cacao butter separates from the beans. Once the butter is removed, the beans are milled into a fine powder. Cocoa is the product of processed cacao; usually cacao is processed at extremely high heat to make cocoa. What does this do? It improves the taste by decreasing bitterness. On the flip side, the high heat processing can decrease the potency of beneficial enzymes and antioxidants. 2.) Dark chocolate is best. There are actually federal definitions for chocolate. Let’s review some common definitions to make sure we're on the same page. Dark chocolate: a chocolate product that is at least 50 percent cacao. Milk chocolate: a chocolate product that is at least 30 percent cacao. Milk chocolate usually contains sugar and vanilla. It may also contain dairy (see #3 below). White chocolate: a product made from cocoa butter and sugar. The health benefits of chocolate are attributed to the cacao. Therefore the higher the percentage of cacao, the better off you are. That means the darker the chocolate (and the higher the percentage), the better off you are. 3.) Dairy in milk chocolate makes it harder for you to get the health benefits of chocolate. Nearly all the research that shows health benefits with cacao and cocoa are completed using powder with NO dairy added. The reason? When milk solids are mixed with cacao, many of cacao’s beneficial nutrients are not absorbed by the body. So if you rationalize chocolate consumption by waxing about the health benefits, make sure you choose dairy-free options. 4.) Many chocolate products contain unnecessary (and often unhealthy) additives. Most chocolate products sold contain unnecessary additives. These additives usually make chocolate worse for you. Think of dairy and milk solids already discussed. They decrease the health benefits of chocolate. Other additives that can be found in chocolate include clay, soy lecithin, and chemical emulsifiers. To make sure you get the most bang for your chocolate buck, pick chocolate without unnecessary additives. 5.) White chocolate is not actually chocolate. Recall from the definitions above that white chocolate is a product made from cocoa butter and sugar. It does not contain cocoa. Therefore, it really isn’t chocolate. While it may be tasty, white chocolate does not contain the health benefits of cocoa. Note: I do NOT have any financial relationships with the companies I recommend below. This is entirely based on my personal opinion and experience. As you can see, not all chocolate is created equally. Expensive and well known chocolate brands are often not the best. While my list of requirements is small, it can be tricky to find a product that fits the bill. My favorite go-to is Theo chocolate (remember, I mentioned back here around the holidays). Theo is an organic chocolate roaster and maker located in Seattle, Washington. Their products are high quality, free of unnecessary additives, and reasonably priced. If you live in Seattle, you can even visit the Theo chocolate factory where they give daily tours. If not, you can find Theo chocolate at a variety of retailers across the United States. 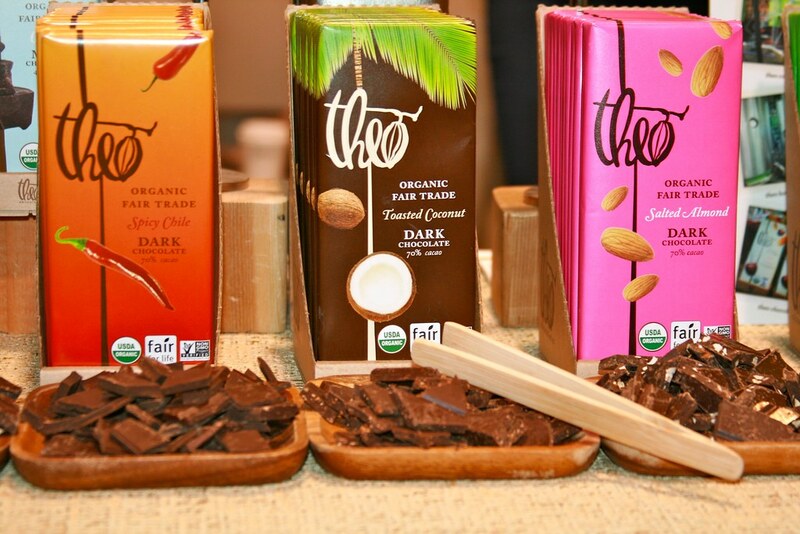 Whole Foods (in store), REI (in store), Amazon (online), and Thrive Market (online) all stock Theo chocolate. If you are looking for chocolate chips or chunks for baking, Enjoy Life makes some great options. The mini chips only include 3 ingredients are free of milk solids and common allergens (such as gluten, peanuts, soy, and eggs). I’ve been known to dip a spoonful of almond butter into the Enjoy Life mini chips for a quick and sweet treat. Natural grocers and Whole Foods usually stock Enjoy Life chocolate chips. I usually buy mine online from Vitacost at a significant discount. Consider yourself chocolate educated! So next time you reach for a chocolate treat (or buy one for someone you love), remember my tips so you can enjoy the health and taste benefits.